Most people will say "why make a Go Skateboarding Day?...you should skate every day!" That's true enough, but the idea is that we all have one big session together around the world. No matter where you are, you will know that others all around the globe are skating also. It's one day to really set everything aside and get out to skate. I did my part. Although I had other plans for the afternoon, I did make sure to get out to the park and get my share of skating in. 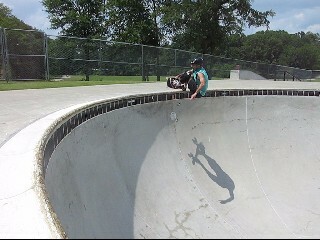 I got to Alabaster around noon and skated till 2:30. For the most part, it was just me skating the bowl. Just me and the wonderful Southern sticky heat! About the time I padded down, Mark Eddgins showed up. I hung out with him for a bit and got some pics. As I was walking out to leave, Tim Spinosi showed up. So at least the old guys made a good showing! haha I was pretty stoked on the day. I had not skated since before Memorial Day (about 4 weeks! ), so I expected to have to learn all over again. Surprisingly (and thankfully), after only a few warm up runs, everything came right back to me. I had my old runs down like I hadn't missed a day! SWEET! I was super stoked on the local kids. Steven and Scotty are really improving a lot. Both were doing 50-50s in the shallow end of the bowl, and they use to rarely skate it at all. Steven did some sick, huge ollies over this rail thing that set up on TOP of the hubbas! All and all, I was happy with my Go Skateboarding Day. Be sure to check out the videos!!! When not skating on GSD, then watch some skating!